There are so many new alternative crypto coins launched pretty much everyday now so it is becoming harder and harder to keep track of these new launches. Not that it is worth checking out each and every one of them, or to try and manage to be ready and mine at the launch of every new coin. It is still good to check the new coin launches and mark a few that seem to offer something new and promising as this could provide you with a good chance to get some extra profit by mining at the launch with low difficulty. This is especially useful for miners that do not have a lot of mining power and want to be able to maximize their chances of getting something extra. We are saying a chance as there is also a risk associated with mining new coins that are not yet being available on any exchange, there is a possibility that some of these new coins will have a very short live and not even get listed on an exchange. 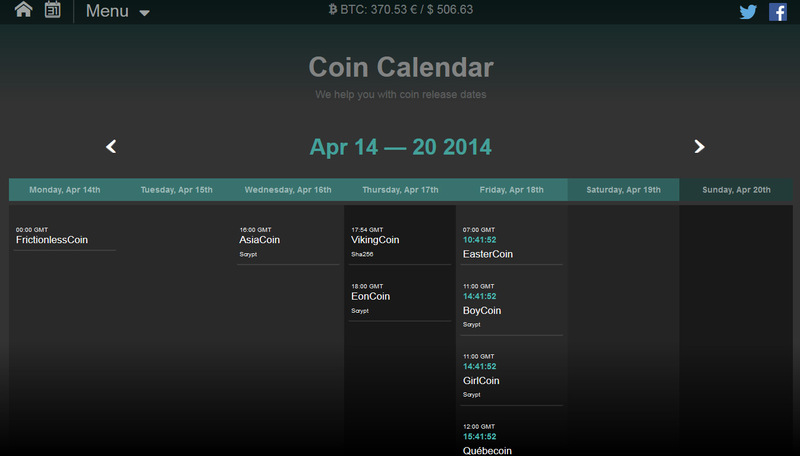 So do approach these new alternative crypto coins with caution when checking them now at the Bitcointalk forum for example or any of the specialized crypto coin launch calendars listed below. If we have missed some alt coin launch calendar worth mentioning please feel free to post in the comments section so we could add it to the list, but these already listed should provide you a good starting point in checking what new crypto is coming and when.